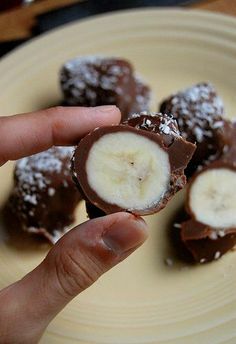 Marion Mom: Frozen Chocolate Banana Bites.... YES! Quick, easy, and yummy. Not too terribly bad either if you use natural peanut butter & unsweetened coconut. This recipe is from another blog I found, the "Never homemaker". You can enjoy them like this (but they really aren't frozen yet -- and when they're frozen, the banana tastes like vanilla ice cream) . . . I suggest then covering with some plastic wrap (or really you can do all of this in some kind of Rubbermaid container) and let freeze overnight.